This chromolithograph is taken from plate 37 of William Simpson's 'India: Ancient and Modern'. The soft hues convey the tranquillity of dusk. 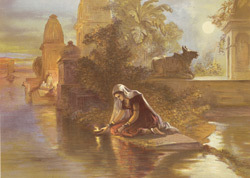 Women floated lit lamps down the Ganges, representing prayers and the journey of the soul through life and beyond. The custom was particularly important during festivals such as Durga Puja, held by Bengalis in honour of the goddess Durga who represents 'Shakti', or the divine power.